Announcement I travel between two studios, so what's for sale depends on where I am. You can see all my work at https://www.flickr.com/photos/sparkflight/. Follow me on Facebook at https://www.facebook.com/SparkflightWire. Love to hear from you by convo if you have any questions! I travel between two studios, so what's for sale depends on where I am. You can see all my work at https://www.flickr.com/photos/sparkflight/. Follow me on Facebook at https://www.facebook.com/SparkflightWire. Love to hear from you by convo if you have any questions! I love birds and this little wren reminds me so much of the wrens that feed at my feeder. He arrived on time and is so sweet and just awesome!!! Upstairs studio, for jewelry & small sculptures. Downstairs studio, with a ceiling hook and pulley for large pieces. Paramount in my life are my fabulous husband (aka my best friend) and our three adult sons, who have always been patient with my need to be creative. Usually that meant carving, drawing, or painting, but in 2006, I had to spend weeks flat on my back recovering from surgery, and I needed something artsy to do in bed. Beads rolled off to who knows where, paint spilled, I didn't know how to knit or crochet, but...I made a bird using jewelry wire! 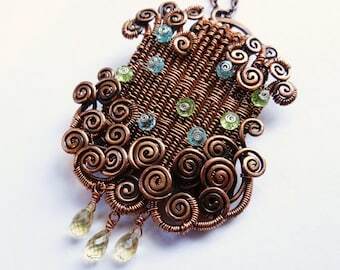 I became obsessed with creating wire sculptures, and within a couple of years, when my work occupied too much home space, I opened my Etsy shop. I named it Sparkflight, the name my oldest son chose for the business he started just before he died. Owner, That's Me. Designer? Also Me. Maker? Me Again. Photographer? Shipper? Janitor? Me. Lots of thought, hard work and affection go into the things I make, so I'm delighted when someone views them, and even happier when someone likes them enough to purchase one. 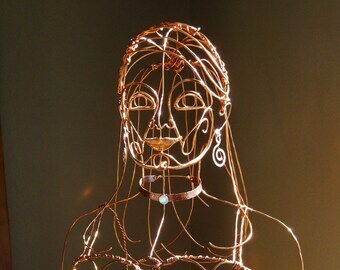 ABOUT THE WIRE SCULPTURES: Each begins with just 2 straight pieces of wire twisted together. I add more pieces of wire to make the structure grow, usually from top to toe. Large sculptures use hundreds of feet of wire. Obviously, all the hand-twisting is a very time-intensive -- and scratchy! -- process, but it results in sturdy, self-supporting, extremely light-weight sculptures. 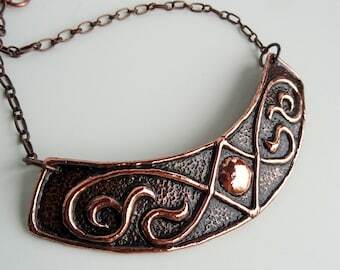 ABOUT THE JEWELRY: Each piece of "wearable sculpture" is designed and created by me, using techniques that result in beautiful, comfortable jewelry that will become heirlooms. Many of my designs look lovely as small wall jewels, too. Whether you buy or not, feel free to convo me with any comments, suggestions, or questions -- I'll answer as promptly as possible. I love working with people to make custom things, so do ask about turning your special ideas into reality. I want HAPPY CUSTOMERS! If you are unhappy with your purchase, just repackage the item and ship it back, at your expense, within 14 days of the delivery confirmation date. After I receive the item in its original undamaged condition, you'll receive a full refund of the purchase price, but not the shipping fees. This does not apply to custom or personalized orders after approval and shipment, or to earrings. Payment for your purchase must be received via Paypal or direct checkout within 3 business days of your purchase date. I accept major credit cards through both Paypal and direct checkout. The shipment cost shown for sculptures may be only for the US, but I am delighted to ship ANYWHERE - just convo first for a shipping quote, and I'll change the listing to reserved for you with the new shipping price. Unfortunately, shipping costs are high for international and/or oversize items. Whenever possible I use recycled materials to save money and the environment. I get quotes and send items by the cheapest method, but for one-of-a-kind sculptures, insurance and delivery confirmation are required. If you are buying locally, pickup or delivery can be arranged. I will notify you when your item ships. I ship to US destinations within three business days of payment receipt, unless otherwise stated; international shipping may take a couple of days more, depending on packaging and insurance requirements. US shipping is by insured USPS, either Priority or First Class, depending on the item; it will say which in the ad. International shipping is by insured USPS Priority Mail International, or as arranged with customer. Unfortunately, I am unable to ship most jewelry to the United Kingdom because of their customs regulations. I would love to create something unique for you. If your commission is for $100 or less, payment in full is expected at the time the order is placed. For items over $100, you'll pay half up front and half at completion, when the "Reserved Listing" is posted. You get to see photos of the commissioned item before purchasing it.